The Clive Cox-trained star won the Darley July Cup and 32Red Sprint Cup in 2017. Races: 12. Wins: 5. Champions Series wins: 2. Prize-money won: £873,503. Clive Cox never made any secret of the regard that he held Harry Angel in and the colt backed up his assertion with some brilliantly speedy performances. Highlights included landing the Darley July Cup at Newmarket and then the 32Red Sprint Cup at Haydock on successive starts in 2017. Had it not been for his restless nature at the stalls, plus a tendency at times to want to get his work done a little quicker than ideal, he would have surely added more victories at the highest level. We got accustomed to him representing Godolphin with distinction, although he carried the colours of Peter Ridgers in his early days. In his two races as a juvenile, Harry Angel was pipped a nose on his debut at Ascot before landing the Group 2 Mill Reef Stakes at Newbury. He returned the following year to make a highly promising return behind Blue Point in the Group 3 Pavilion Stakes at Ascot and built on that when routing his rivals in the Group 2 Sandy Lane Stakes at Haydock. By the time Harry Angel ran in the Commonwealth Cup a month later, he had changed ownership. It is unclear how much Sheikh Mohammed had to pay to acquire the son of Dark Angel but it is unlikely the Ruler of Dubai had any cause for regret. Harry Angel came up a bit short at the Royal Meeting, finding Caravaggio three-quarters of a length too strong after a stirring contest, but it still represented a personal best. “It was a great run, a great horse race,” Cox said. “He wore his heart on his sleeve a little bit there but when you take the blindfold off them and they jump that quick there’s not a lot you can do about it. How right Cox was. Harry Angel turned the tables on his conqueror in the July Cup the following month and then romped home by four lengths from Tasleet in the 32Red Sprint Cup at Haydock. His connections had been concerned by the soft ground in the latter race but, as usual, Harry Angel travelled strongly near the head of affairs under regular rider Adam Kirby before breezing clear. As a consequence, he went off 5/4 favourite to sign off for the campaign with another win in the QIPCO British Champions Sprint but he faded to be fourth in the testing ground after being awkward at the stalls and never really settling. Godolphin opted to keep him in training as a four-year-old and he began his 2018 campaign with a two-length defeat of the race fit Brando in the Group 2 Duke Of York Stakes, when conceding weight. However, things went badly astray in the Diamond Jubilee Stakes at Royal Ascot on his next start when he grew agitated in the stalls and lost all chance at the start. To add insult to injury, he suffered a cut leg and had to miss his defence of the July Cup. He was able to try for back-to-back wins in the Sprint Cup but, too fresh after his absence on rain-soaked ground, he got weary and drifted back through the field to finish sixth. 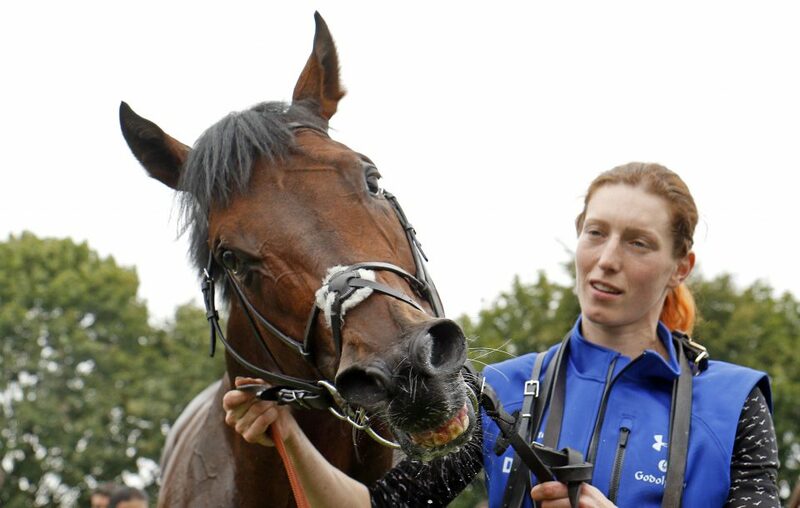 By now, some of his fan club had lost a little trust in him but he went a long way to restoring his reputation when beating all bar Sands Of Mali in the QIPCO British Champions Sprint. He travelled strongest of all but could not pick up in the soft ground. Soon after, his retirement to the breeding sheds was confirmed. Cox lamented afterwards that his speedster had often had to race on going that, to his mind, blunted his pace. Regardless, he was a rapid colt who at his peak had an official rating of 125. Harry Angel had come of age on his previous start, when landing the Darley July Cup, but this was the day when his brilliance completely shone through. Clive Cox was anxious how his stable star would cope with the soft ground and that was reflected by the betting – Harry Angel being sent off at 2/1 to beat his ten rivals despite having much the best overall form. The outcome was never in much doubt from the start. Harry Angel broke alertly, raced with zest at the head of affairs and then surged clear inside the final furlong without Adam Kirby having to ask for everything. The winning distance was four lengths – a margin rarely achieved in Group 1 sprints – and the form had substance with Tasleet, a confirmed mudlark, chasing him home, and The Tin Man another length and a half back in third. Blue Point, a familiar rival, was beaten a total of eight lengths into fourth. Harry Angel went into the race with an official rating of 119 and the handicapper was suitably impressed, raising him to 125. “I think his brilliance, excitement and performance at the racetrack far outweighs the few hiccups that we had. “He was a spectacular horse to be involved with and it was an extremely exciting chapter in mine and my whole teams’ lives. We’re very proud to have been a part of such a special horse. “Haydock seemed to bring the best out of him. Both the Sandy Lane, where he broke the track record on very fast ground, and then the Sprint Cup last year where it was the complete opposite were truly amazing performances. “It showed what an able and brilliant performer he was really. He was just top class all the way through. At Darley’s Dalham Hall Stud in Newmarket. His initial covering fee is £20,000. Harry Angel has become the highest-rated sprinter to retire to stud in Britain for more than 30 years and the snap answer has to be “speed”. But that’s not to say that his offspring will be exclusively sprinters, especially if the right middle-distance broodmares arrive at his door. There is also some latent stamina in his pedigree. His dam stayed a mile (and was a half-sister to smart 1m2f winner Xtension) plus he is a half-brother to 1½m winner Golden Journey. In common with plenty of Dark Angel’s stock, Harry Angel was a precocious two-year-old and it would be no surprise if he was responsible for a smart juvenile or two – just as his sire was before him. The one part of his make-up that breeders will be hoping he does not pass on was his awkward/nervy nature at the stalls. It seemed he was claustrophobic but had he been a calm individual would he have had such explosive speed? Let’s hope one of his sons or daughters also rights a wrong by winning at Ascot. Much was made of Harry Angel failing to win at the Royal Course in five visits, but he finished 242 in three Group 1 races there and was runner-up on his other two appearances. “I’m so proud that he’s delivered in the fashion that we thought was possible and it’s a wonderful feeling to have a horse like this on our hands,” Cox said.